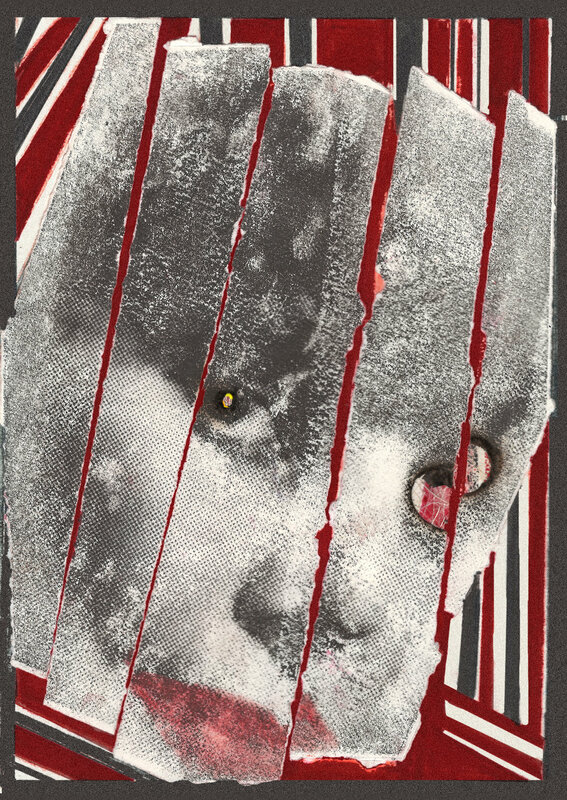 Transfer Monoprint, burned with a cigarette lighter, torn in five pieces and collaged onto an acryl gouache painting. Drypoint with a la poupee inking. Four monoprints highlighted with fabric dye crystals overlaid, scraped and burnished and adhered to stiff support. "Only Execution Will Rehabilitate Me"
In October 2017, Eric K. Lerner’s work was featured in an Exhibition 1917 Tarot in St Petersburg, Russia, commemorating the 100th Anniversary of the Russian Revolution. The Exhibition traveled to Madrid, Spain the following year. It is has immortalized in the brilliant 1917 Tarot from Silhouette. In addition to Lerner, the exhbition and deck featured works from Osvaldo Menegazzi, Giordano Berti, Robert Place, Alexander Daniloff, Carlos Pumariega , Silvia Ordoqui and 33 other international and Russian artists. All of these works are hand made prints, using a wide range of techniques, including etching, monoprinting and silkscreen. A drypoint created in a variable edition of 6 for Aqua Regia Studio’s 2016 Show at Md Hall. 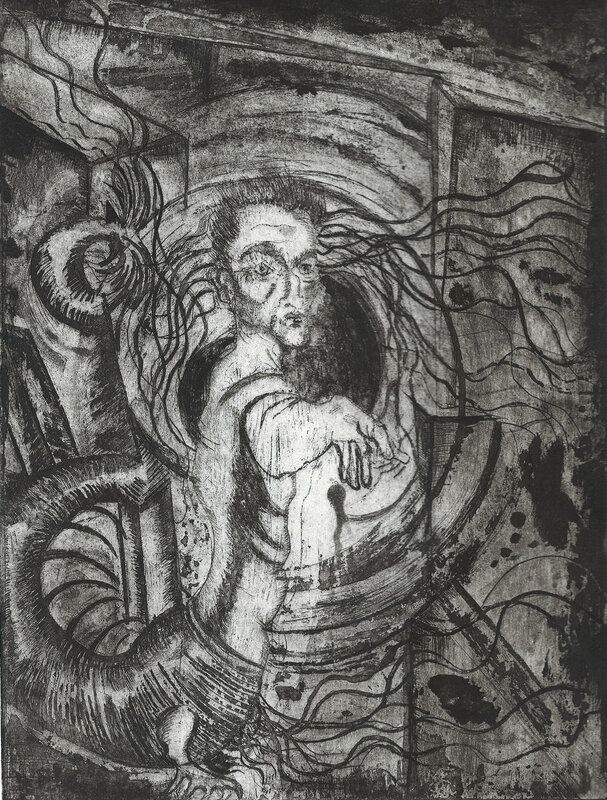 Etching with open bite (not aquatint) that exists in two a.p.’s It has yet to be editioned. Etching with drypoint, aquatint and spit bite. From a series of silkscreen overlaying the yellow channels of cmyk bitmaps with text bits from the Anarchist handbook. Woodcut given both relief roll and intaglio wipe. Sold. Gelatin Monoprint from a loose variable edition of 22. “Every printmaker likes to experiment. For instance in the silkscreen sample, the idea was to produce a series of prints using pages, sometimes flipped, from The Anarchist Handbook overlaying the yellow channel from cmyk bitmaps. Everyone thinks that the face-like figure is you know who but it’s actually the yellow channel from a scan of a gelatin print depicting The Devil. I used very loose inks. I wanted to mimic the appearance of photocopied zines and mimeographs from the days of the No Wave Scene in NYC, where I developed much of my aesthetic and was lucky enough to engage with many of the leading counter-cultural figures of the time. So I chose loose inks that would to evoke photocopy and mimeograph ink. When it comes to woodcut, I often work quickly with just a light sketch on the wood and try to unearth shapes from the wood grain pattern rather than work in a more clearly delineated style. In this example there was no underlying drawing. I frenetically exaggerated the grain and cut and gouged away until the figures emerged. With the transfer print example I worked form a color and black and white laser print from another photo I took back in the 1990’s I collaged these with the Daily News Headline from Judy Garland’s funeral, which was the same day the Stonewall Riots broke out. I use a combination of burnishing techniques and let the solvent pool in places and scarcely touch others to create more painterly effects.